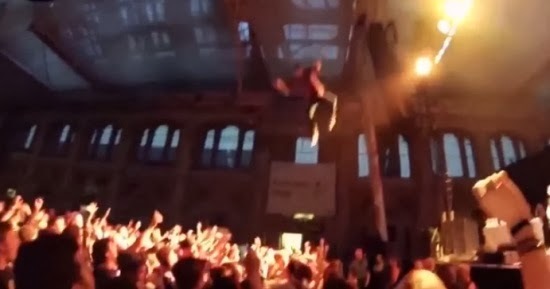 US rapper George Watsky stage dived from the top of a lighting truss high above the audience during a rock festival show in north London on Sunday. But as this video shows, his stunt went dramatically wrong. The audience can be seen parting to avoid Watsky as the 27-year-old comes crashing to the floor. Watsky reportedly only sustained cuts and bruises from the fall but two fans were injured, including one woman who suffered a broken arm.